Samuel HEDGE (1675 – 1714) was Alex’s 8th Great Grandfather; one of 512 in this generation of the Shaw line. 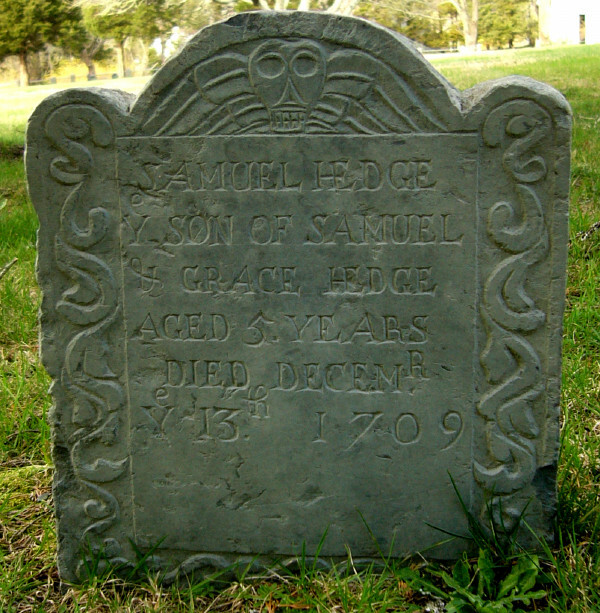 Samuel Hedge was born 18 Jun 1675 in Yarmouth, Barnstable, Mass. His parents were Elisha HEDGE and Mary STURGIS. He married Grace SNOW on 8 Dec 1698 Eastham, Barnstable,, Mass. 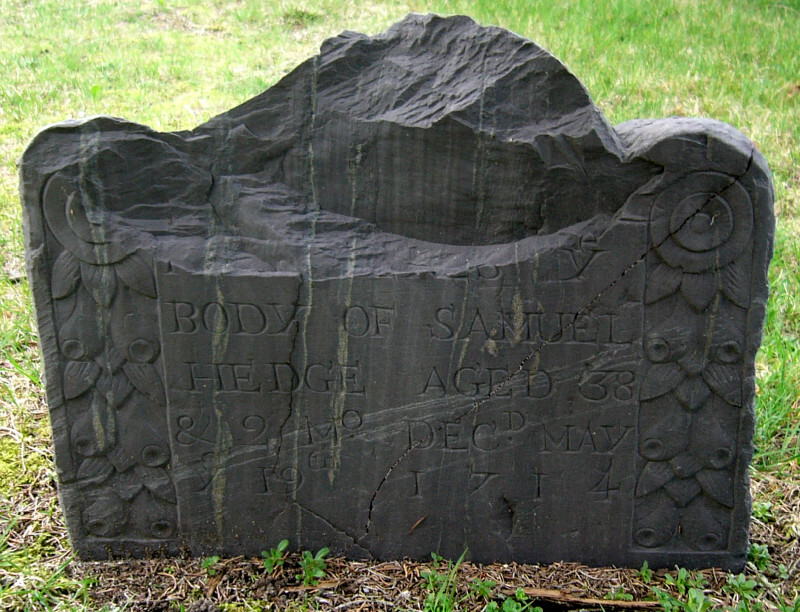 Samuel died 19 May 1714 Eastham, Barnstable, Mass. Grace Snow was born 1 Feb 1675 in Eastham, Barnstable, Mass. Her parents were Lieutenant Jabez SNOW (1642-1690) and Elizabeth SMITH (1648-1755). 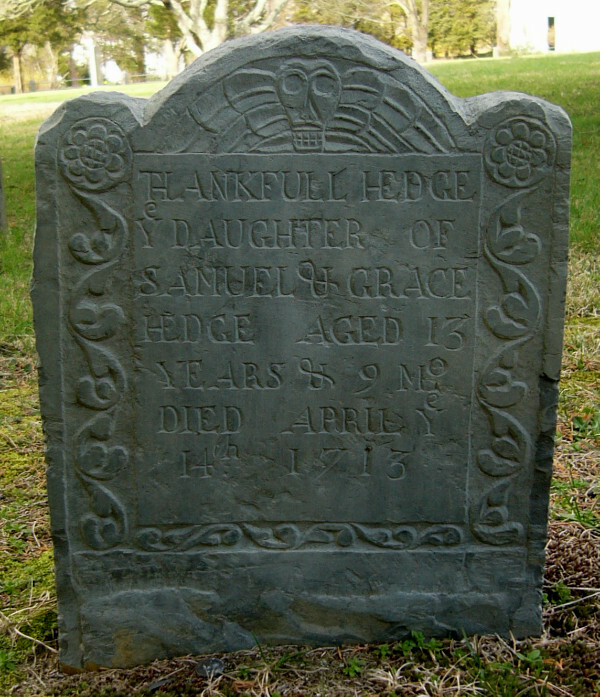 After Samuel died in 1714, she married 21 Jul 1716 in Eastham, Barnstable, Mass to George Lewis Grace died 21 Jul 1716 in Eastham, Barnstable, Mass. George Lewis was born in 1672 in Barnstable, Mass. His parents were Joseph Lewis (1632 – 1675) and Sarah Lane (1635 – 1697) He first married 14 Jun 1711 Barnstable, Barnstable, Mass. to to Alice Crocker (b. 25 Dec 1679 in Barnstable – d. 23 Feb 1718? in Barnstable) George and Alice had four children born between 1712 and 1716. George died Nov 1769 in Barnstable, Mass. Two first cousins named Thankful Hedge were born a couple years apart on Cape Cod. Either one may have married our ancestor Edward STURGIS IV. Both show a death of 17 Apr 1762 in Yarmouth, Barnstable, Mass. Thankful Hedge was born 17 Apr 1714 in Eastham, Barnstable, Mass. Her parents were Samuel HEDGE and Grace SNOW. Another Thankful Hedge was born 23 Oct 1712 in Yarmouth, Mass. Her parents were Samuel’s brother John HEDGE and Thankful LOTHROP. 20 Oct 1733 Barnstable, Mass 15 Jun 1734 Boston, Mass. Mary died two days before her father at age twelve. Genealogies sometimes record Samuel as Lamuel, looks like an “S” to me. Samuel’s (age 5) name was used again in three months. Elisha’s wife Martha Johnson was born 6 Oct 1 702 in Marlborough, Middlesex, Mass. Martha’s parents were Daniel Johnson (b. 5 Apr 1675 Marlborough – d. 27 Apr 1721 Marlborough) and Dorothy Lamb (b. 8 Jun 1679 in Roxbury, Suffolk, Mass. – d. 7 Jan 1760 in Marlborough) Martha died 4 Nov 1765 Shrewsbury, Worcester, Mass. The town of Shrewsbury was first settled in 1722 and officially incorporated in 1727. Townspeople created an agricultural economy with apple orchards and by 1750 there were two stores and four taverns as well as several small industries in operation. The rapid fall of prices for agricultural goods, the shortage of hard currency and the general economic depression following the Revolutionary War produced disastrous conditions for colonists. Shays’ Rebellion in 1786 sought to close the courts to prevent debt collections and the foreclosure of mortgages. Shrewsbury became a staging area for the rebellion and the encampment of the more than 400 insurgents, before the march on the Worcester Court House. Shrewsbury is now a suburb of both Boston and Worcester, about 45 minutes from Boston and 10 minutes to downtown Worcester. i. Elisha Hedge b. 14 Feb 1729 in Shrewsbury, Worcester, Mass. ; d. 26 Dec 1777 Yarmouth, Barnstable, Mass. ; m. 25 Dec 1750 – Worcester, Worcester, Mass. to Deliverance Streans (b. 1735 in Worcester, Mass. – d. 4 Jun 1819 in Hardwick, Worcester, Mass.) Deliverance’s parents were John Stearns (1692 – 1728) and Deliverance Bigelow (1695 – 1762) Elisha and Deliverance had six children born between 1751 and 1760.
iv. Rev. Lemuel Hedge b. Jul 1734 in Shrewsbury, Worcester, Mass. ; d. 15 Oct 1777 Warwick, Mass. ; m. 5 Nov 1761 in Hardwick, Worcester, Mass to Sarah White (b. 29 May 1741 in Hardwick, Worcester, Mass. – d. 1808 in Middlebury, Vermont). Sarah’s parents were David White (b. 1710) and Susanna Wells (1714 – 1783). Lemuel and Sarah had seven children born between 1766 and 1776. Warwick, Franklin, Mass. was first settled in 1739 and was officially incorporated in 1763. The land that became Warwick was one of four tracts of land established by Massachusetts in 1735 to compensate the descendants of the officers and soldiers who served during the “expedition to Canada” and the Battle of Quebec in 1690. The area was initially called Gardner’s Canada and original proprietors were named in 1736. A 1737 owners list names the initial land owners, few of whom appear to have remained to settle the town once it was incorporated in 1763. As the Revolutionary War approached, the town voted unanimously in favor of independence, although the town minister preached against it. Rev. 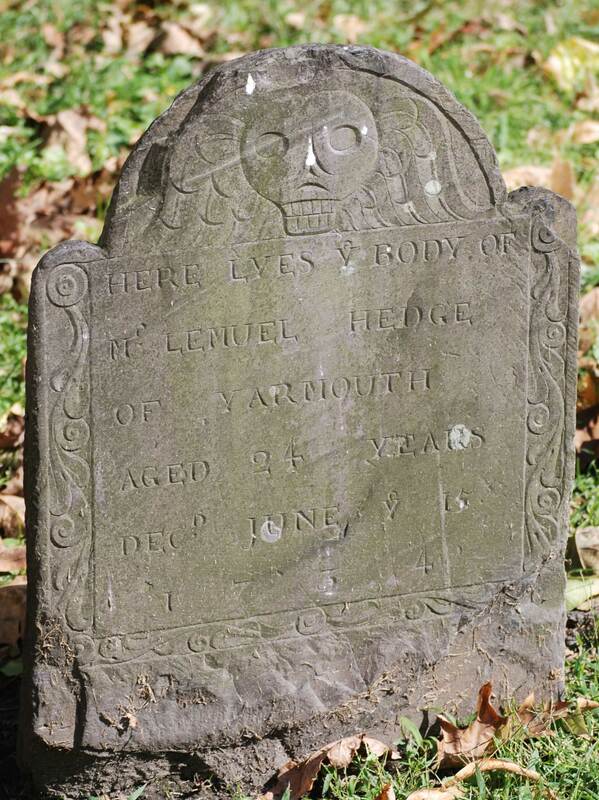 Lemuel Hedge was barred from leaving the town in July 1775. He died 15 October 1777, the day British General Burgoyne surrendered his troops to the colonists in Saratoga. In 1776, Lieutenant Thomas Rich was selected to represent the town at the General Assembly of Massachusetts. 41 page sermon delivered by Rev. Lemuel Hedge in 1772. 1759 – Lemuel graduates from Harvard University at the age of 25. 3 Dec 1760 – Hired to be the Minister of the Congregational Church, Warwick, Franklin, Mass. Jul 1775 – As the Rev. War approached, Rev. 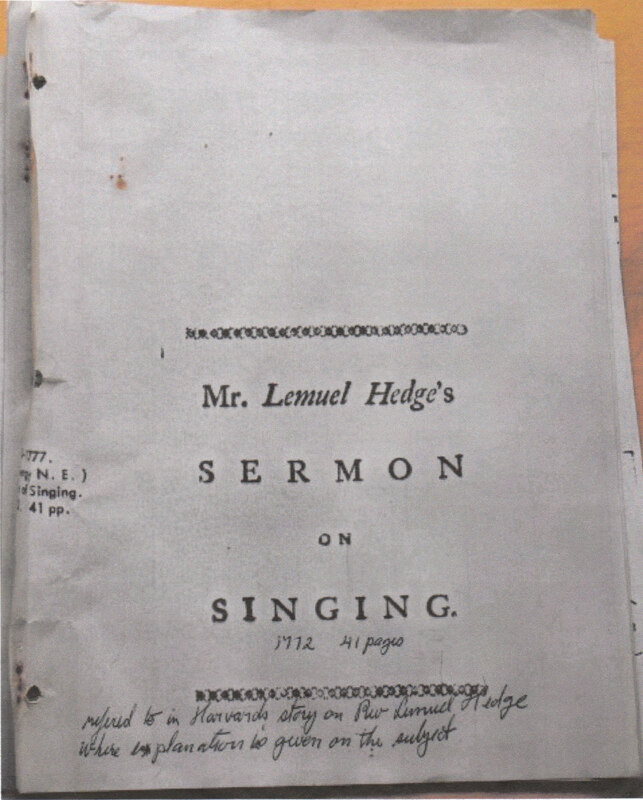 Lemuel Hedge, an admitted Tory, preached against independence from England. For this he was disarmed & barred from leaving the town of Warwick. Aug 1775 – Lemuel was arrested by a group of 40 Patriots. They intended to transport him to Northampton for imprisonment, but were eventually compelled to release him. 15 Oct 1777 – Lemuel, an admitted Tory , was considered to have died as the result of persecution. vi. Martha Hedge b. 1738 in Mass. ; d. 23 Nov 1809 Barre, Worcester, Mass. ; ; Burial: Adams Cemetery, Barre; m. 7 Jul 1753 in Hardwick, Worcester, Mass. to Joseph Robinson (b. 13 Sep 1727 in Rochester, Plymouth, Mass. – d. 16 Dec 1814 in Barre, Worcester, Mass. ; Burial: Adams Cemetery, Barre) Joseph’s parents were James Robinson ( – 1762) and Martha and Joseph had twelve children between 1754 and 1780. Originally called the Northwest District of Rutland, Barre was first settled in 1720. The town was incorporated on June 17, 1774, as Hutchinson after Thomas Hutchinson, colonial governor of Massachusetts. But on November 7, 1776, it was renamed Barre in honor of Isaac Barré, a champion of the American Colonies. i. James Morrice b. 12 Aug 1737 Boston, Mass. This entry was posted in 10th Generation, Historical Monument, Line - Shaw and tagged Eastham, Yarmouth. Bookmark the permalink.